Suffers from familiarity if you're a horror fan, but it's a great way to get those who aren't in theaters to see it. Made for horror fans and those eagerly awaiting to see if Peele can live up to expectations. Trying to follow-up the brilliant Get Out would be no easy task for anyone. 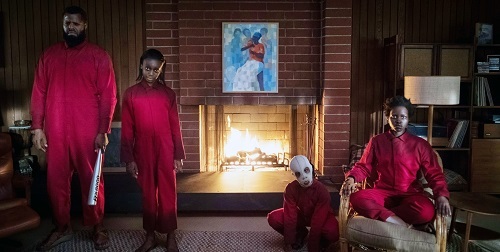 Jordan Peele comes close with Us, stumbling with a final twist horror fans will see coming a mile away. A second viewing will clear up some questions, but it’s also going to raise more. While new layers and nuances abound with Get Out, Us is best taken at face value. Repeat viewings will be fun, but the screenplay doesn’t come close to Get Out. In the long run, what Peele has managed to do is bring in an audience who would normally never watch these kinds of films. In 1986, Adelaide (Madison Curry) is visiting a boardwalk in Santa Cruz with her parents. After wandering off, she enters a fun house where she comes face-to-face with a doppelgänger leaving her traumatized. Now grown (Lupita Nyong’o) with a family of her own — husband Gabe (Winston Duke) and children Zora (Shahadi Wright Joseph) and Jason (Evan Alex) — Adelaide is vacationing back in Santa Cruz. Soon enough, a series of coincidences pointed out by her friend Kitty (Elisabeth Moss), can’t prepare her for when doppelgängers of her entire family come knocking. Now, everyone is in a fight for their lives to escape their clutches, find out who they are, where they came from, and what they want! A lot of hype has been building since Us debuted at SXSW and for good reason. This is a very well constructed thrill ride that keeps you intrigued from start to finish. The cast is pitch perfect keeping us laughing one minute and on the edge of our seats the next. Nyong’o gives the lead performance she’s been waiting for and this is the most tolerable Tim Heidecker has ever been. Michael Abels’s score is also one of the best horror scores in a long time. There may be a few bumps along the way, but at least it doesn’t completely fall apart. The idea of violent doppelgängers is terrifying enough, it’s too bad there are so many questions unanswered. Normally, horror movies better when there’s an air of mystery, unfortunately in the case of Us, it’s a tad too mysterious. Us may not be Oscar worthy, but that’s no reason not to just sit back, enjoy the ride, and let it terrorize you as Peele intended.